A CWB reader discovered that one of our reports sounded awfully familiar, largely because she was the victim of the crime that we wrote about. I think the first crime you mentioned was me! I was pick pocketed on the SB Clark bus about 5:30 pm last Monday. I was sitting and reading a book with the flap of my messenger bag unfortunately unzipped, since I'd be exiting in 2 stops and putting the book away soon. The man was standing and holding the pole. He was carrying what appeared to be drycleaning but I now know it was to cover his arm. He leaned over me way too much pretending the motion of the bus was causing him to stumble around while trying to pull the cord. Like he got his junk way up in my face!!! The woman he was with didn't at first seem to be with him. She was wearing a multi colored sock hat, dark skinny jeans, white tennis shoes with thick soles and had a full length black North Face coat. They got off the bus together [at Aldine and School] and talking closely to each other. From there, based on my Ventra scans, they immediately hopped on the Belmont bus. There were 3 transactions on Belmont buses. They charged $100 to my debit card at the Belmont L station. Nothing after that as I shut everything off. HOWEVER, on Monday I got a call from the currency exchange at Kedzie & Chicago stating a cashier's check for $3000 that I had cashed was returned stopped payment. I informed them it was fraud but now I have to deal with that b.s. And who knows what other stuff will trickle in! The hilarious thing is the thief spelled my name wrong on said forged cashier's check which is a dead give away that it IS NOT ME.. plus they have the security footage. I gave the police all the specific transit scans from them briefly using my actual Ventra card. Guessing they could pull surveillance from the Belmont L where they illegally used my debit card to buy a new card with $100 on it. 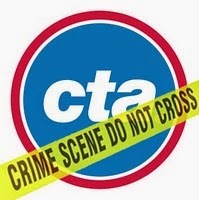 Ventra cards are quickly becoming the #1 thing that thieves buy with stolen credit cards—we hear about it constantly. At any rate, there are some good reminders here for all of us who zone out on the CTA.